Wir Fliegen (We’re Flying)*** is a 2008 collection consisting of twelve stories, the majority coming in at somewhere around twelve pages. The style and language is unmistakably Stamm, with his clipped, simple language and the slightly uncomfortable feeling he evokes in his creations. However, the smaller canvas he works on in his stories means that matters come to a head a lot more quickly. Several stories also look at the distance which exists between two people, a gap which can never quite be bridged. The first story, ‘Die Erwartung’ (‘Expectations’), looks at a relationship between two neighbours, one which somehow never manages to get off the ground. There’s something not quite right about the man, and the interaction between the couple is stilted (and slightly creepy…). In ‘Fremdkörper’ (‘A Foreign Body’), this sense of unease is heightened when a cave explorer spends an unusual evening with a couple he’s just met. Even in a moment of intimacy, Stamm uses the subjunctive, indirect speech to create a sense of distance. 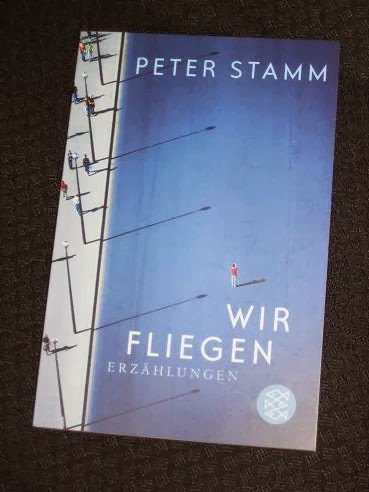 It’s a structure that’s more common in German than English, but I always feel that Stamm uses it deliberately to create a wall between the reader and the narrator – and the narrator and the people they are interacting with. Of course, there’s always room, and time, to turn your life around, and two of the better stories look at this idea of a tipping point. In ‘Der Befund’ (‘The Result’), a man waits for his biopsy results, using the time alone working the night shift at a hotel to work out what he wants from life. The title story, ‘Wir Fliegen’ (‘We’re Flying’), also follows this thought, with a childcare worker forced to care for a child after hours seeing her partner through new eyes – and it’s not a pretty picture. As much as I like his novels, I think he's even better in the shorter form but that may be because I came to him that way. I will certainly read this sooner or later as well. I'm not sure of his latest novel. have you had a look? It doesn't soud like him.